New FEC for RTNC on 3638.00MHz, pol.R: FEC:3/4 ( SR:3716 SID:1 PID:5378[MPEG-4]/5379 - BISS). A new channel has started in DVB-S2 BISS: RTNC (Congo) on 3638.00MHz, pol.R SR:3716 FEC:5/6 SID:1 PID:5378[MPEG-4]/5379. A new channel has started in DVB-S2 Clear: RTNC (Congo) on 12690.00MHz, pol.V SR:30000 FEC:3/5 SID:24 PID:2401[MPEG-4]/2402 French. New frequency for RTNC: 3985.00MHz, pol.R (DVB-S SR:13555 FEC:5/6 SID:1 PID:512/768- Clear). New SID for RTNC on 4052.00MHz, pol.R FEC:5/6 SR:10890: SID:1 ( PID:512/768 - Clear). New SR for RTNC on 4052.00MHz, pol.R: SR:10890 ( FEC:5/6 SID:1 PID:512/768 French - Clear). RTNC has left 4052.00MHz, pol.R (DVB-S SID:1 PID:512/768 French), it is no longer transmitted by satellite in Europe. New SR for RTNC on 4052.00MHz, pol.R: SR:10148 ( FEC:3/4 SID:1 PID:512/768 French - Clear). 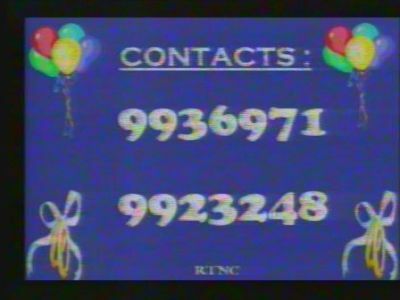 A new channel has started in DVB-S Clear: RTNC (Congo) on 4052.00MHz, pol.H SR:8552 FEC:3/4 SID:1 PID:512/768 French. Multichoice Africa: RTNC has left 11958.00MHz, pol.V (DVB-S SID:912 PID:434/435 French), it is no longer transmitted by satellite in Europe. RTNC has left 11641.00MHz, pol.H (DVB-S SID:3 PID:49/52 French,54), it is no longer transmitted by satellite in Europe. RTNC is back on 11641.00MHz, pol.H SR:2532 FEC:3/4 SID:3 after a break ( PID:49/52 French,54 - Clear). A new channel has started in DVB-S Clear: RTNC (Congo) on 11641.00MHz, pol.H SR:2532 FEC:3/4 SID:3 PID:49/52 French,54. RTNC has left 11276.00MHz, pol.H (DVB-S SID:5 PID:2005/3005 French), it is no longer transmitted by satellite in Europe. RTNC is now encrypted in Irdeto 2 (11276.00MHz, pol.H SR:11100 FEC:5/6 SID:5 PID:2005/3005 French). RTNC is testing in DVB-S Clear on 11276.00MHz, pol.H SR:11100 FEC:5/6 SID:5 PID:2005/3005 French. RTNC has left 12644.00MHz, pol.H (DVB-S SID:1 PID:4194/4195 French), it is no longer transmitted by satellite in Europe. RTNC is back on 12644.00MHz, pol.H SR:2002 FEC:5/6 SID:1 after a break ( PID:4194/4195 French - Irdeto 2). RTNC has left 10965.50MHz, pol.V (DVB-S SID:1 PID:4194/4195 French), it is no longer transmitted by satellite in Europe. New frequency for RTNC: 10965.00MHz, pol.V (DVB-S SR:2002 FEC:5/6 SID:1 PID:4194/4195 French- Irdeto 2). A new channel has started in DVB-S Irdeto 2: RTNC (Congo) on 11594.00MHz, pol.H SR:2002 FEC:5/6 SID:1 PID:4194/4195 French. RTNC is now encrypted in Irdeto 2 (12644.00MHz, pol.H SR:2002 FEC:5/6 SID:1 PID:4194/4195 French). RTNC (Congo) is now transmitted Free To Air (12644.00MHz, pol.H SR:2002 FEC:5/6 SID:1 PID:4194/4195 French). A new channel has started in DVB-S Clear: RTNC (Congo) on 12644.00MHz, pol.H SR:2002 FEC:5/6 SID:1 PID:4194/4195 French. African United TV: RTNC has left 12606.00MHz, pol.H (DVB-S SID:11 PID:4353/4354 French), it is no longer transmitted by satellite in Europe. African United TV: New SID for RTNC on 12606.00MHz, pol.H FEC:5/6 SR:28800: SID:11 ( PID:4353/4354 French - Irdeto 2). African United TV: RTNC has left 12606.00MHz, pol.H (DVB-S SID:13 PID:4865/4866 French), it is no longer transmitted by satellite in Europe. RTNC is testing in DVB-S Clear on 12149.00MHz, pol.V SR:27500 FEC:3/4 SID:7226 PID:245/246 French. African United TV: RTNC (Congo) is now transmitted Free To Air (12606.00MHz, pol.H SR:28800 FEC:5/6 SID:13 PID:4865/4866 French). RTNC is encrypted again after being temporarily unencrypted on 12606.00MHz, pol.H SR:28800 FEC:5/6 SID:13 PID:4865/4866 French (Irdeto 2). RTNC is now encrypted in Irdeto 2 (12606.00MHz, pol.H SR:28800 FEC:5/6 SID:13 PID:4865/4866 French). A new channel has started in DVB-S Clear: RTNC (Congo) on 12606.00MHz, pol.H SR:28800 FEC:5/6 SID:13 PID:4865/4866 French. RTNC has left 11583.00MHz, pol.H (DVB-S SID:31 PID:301/351 French), it is no longer transmitted by satellite in Europe. RTNC is back on 11583.00MHz, pol.H SR:20150 FEC:3/4 SID:31 after a break ( PID:301/351 French - Clear). A new channel has started in DVB-S Clear: RTNC (Congo) on 11583.00MHz, pol.H SR:20150 FEC:3/4 SID:31 PID:301/351 French. RTNC has left 12745.00MHz, pol.V (DVB-S SID:1 PID:308/256 French), it is no longer transmitted by satellite in Europe. New frequency for RTNC: 12745.00MHz, pol.V (DVB-S SR:6111 FEC:3/4 SID:1 PID:308/256 French- Clear). New frequency for RTNC: 12743.00MHz, pol.V (DVB-S SR:3215 FEC:3/4 SID:1 PID:308/256 French- Clear). New frequency for RTNC: 12553.00MHz, pol.V (DVB-S SR:6111 FEC:3/4 SID:1 PID:1160/1120 French- Clear). A new channel has started in DVB-S Clear: RTNC (Congo) on 11500.00MHz, pol.H SR:6111 FEC:3/4 SID:1 PID:1160/1120 French. RTNC has left 11002.00MHz, pol.H (DVB-S SID:1 PID:4194/4195), it is no longer transmitted by satellite in Europe. New PID for RTNC: PID:4194/4195 SID:1 (11002.00MHz, pol.H SR:6510 FEC:3/4 - Clear). New PID for RTNC: PID:32/8191 SID:1 (11002.00MHz, pol.H SR:6510 FEC:3/4 - Clear). New frequency for RTNC: 11002.00MHz, pol.H (DVB-S SR:6510 FEC:3/4 SID:1 PID:4194/4195- Clear). A new channel has started in DVB-S Clear: RTNC (Congo) on 11685.00MHz, pol.H SR:6510 FEC:3/4 SID:1 PID:4194/4197.